Hi, I have just bought a 3 metre rubber duck with 5 horse power Honda on the back for my two boys Xmas present this year. I am desperate to find a suitable name for their boat and need your help. They both love the water and are good swimmers and enjoy playing water polo. I would definitely suggest a Christmas theme to the boat name. I mean, how often are boats given as Christmas gifts? I believe this is quite unique, but I could be mistaken. Here's what I sent him... Click "comments" below if you've got better boat name ideas for the lads. 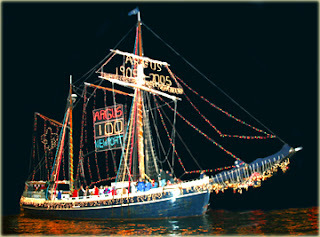 By the way, thanks to the 99th Annual Newport Beach Christmas Boat Parade.